Mitch is the messy chef behind the counter at Papa’s Taco Mia! He won his position after competing in the Taco Eating Contest. Although he is only an amateur eater, he strives to one day be like his hero, Kenji. When Mitch isn’t eating or building tacos, he can usually be found enjoying the outdoors. 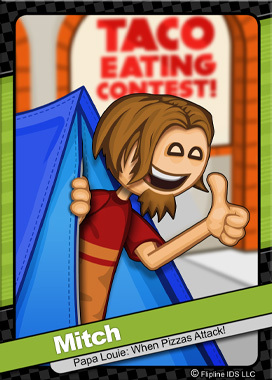 Mitch enjoys camping, hiking, and kayaking. He also loves fishing with his Grandpa Wally.